Explore Mediterranean flavors with the Asparagus Salad with Lemon & Feta. A super-simple sauce and a sprinkling of feta dress up this asparagus salad. Bring about 1/2 inch water to boil in large skillet. Add asparagus; cover. Simmer 3 to 4 min. or until asparagus is crisp-tender; drain. Rinse asparagus with cold water; drain well on paper towels. Meanwhile, mix mustard and lemon juice in small bowl. Gradually add oil, whisking constantly until well blended and thickened. 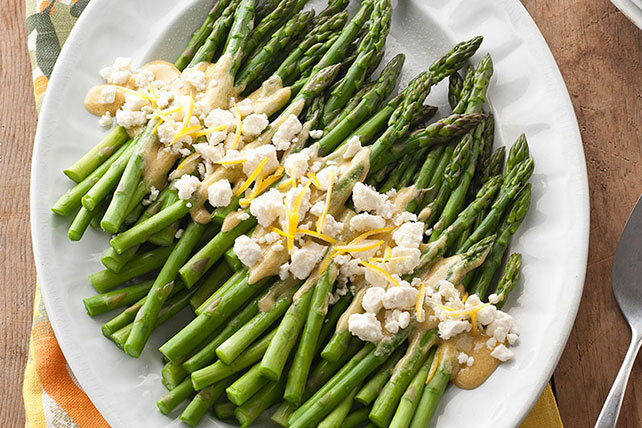 Place asparagus on plate; top with mustard sauce, cheese and lemon zest. Sprinkle with cracked black pepper just before serving. Pierce the thickest part of the asparagus with the tip of sharp knife or fork. The asparagus is done when the stalk is just tender and meets the knife with slight resistance. Do not overcook the asparagus as this will cause the asparagus to become mushy.